Hombuja, 17th April 2019: The Mahavir Janmakalyana/Jayanthi celebrations at Sri Kshetra Hombuja was held under the presence of Acharya 108 Sri Vardhamansagarji Muni Maharaj and Sangh and under the guidance of His Holiness SwastiSri Dr.Deevendrakeerthi Bhattarakha Swamiji of Hombuja. The idol of Lord Mahavir from Bogara Basadi was taken out in a silver pallakki (planquin) in all roads of Hombuja. The Muni sangh, Sri Bhattarakha Swamiji and devotees accompanied the pallakki. This was followed by panchamrutha Abhisheka of Lord Mahavir idol. Acharya Sri Vardhamansagarji Muni Maharaj and Sri Deevendrakeerthi Bhattarakha Swamiji delivered the religious discourse on the occasion. Hombuja, 6th April 2019: Special pooja was conducted at Sri Kshetra Hombuja on the occasion of Ugadi – 2019 to signify the beginning of Vikarinama Samvatsara. The pooja was performed at Parshwanath Swamy temple, Padmavati temple and Matada Basadi. It was performed under the holy presence of Acharya 108 Sri Vardhamansagarji Maharaj and Sangha and under the guidance of His Holiness SwastiSri Dr. Devendrakeerthi Bhattarakha Swamiji. Hombuja, 27th March 2019: As part of the annual rathayatra celebrations the ‘Ahtavadhana’ seva to Goddess Padmavati was offered. This is a unique ritual that has been in practice at Humcha where in Goddess Padmavati is offered seva in eight different forms of music on the evening of Maharathotsava day. It was held under the guidnace of His Holiness Swasti Sri Dr. Devendrakeerthi Bhattarakha Swamiji of Hombuja Jain Math. His Holiness Swasti Sri Bhanukeerthi Bhattarakha Swamiji of Kambadahalli Jain Math, & His Holiness Swasti Sri Dhavalakeerthi Bhattarakha Swamiji of Arihantagiri (Tirumalai) Jain Math were also present on the occasion. Hombuja, 27th March 2019: The maharathotsava of Lord Parshwanath and Goddess Padmavati was held at Sri Kshetra Humcha with religious fervour. Thousands of devotees from all over the state had flown to Hombuja to witness the event. It was held under the guidnace of His Holiness Swasti Sri Dr. Devendrakeerthi Bhattarakha Swamiji of Hombuja Jain Math. His Holiness Swasti Sri Bhanukeerthi Bhattarakha Swamiji of Kambadahalli Jain Math, & His Holiness Swasti Sri Dhavalakeerthi Bhattarakha Swamiji of Arihantagiri (Tirumalai) Jain Math were also present on the occasion. Acharya 108 Sri Vardhamansagarji Maharaj and Sangh graced the occasion. The day began with Jala and Panchamrutha pooja to Lord Parshwanath & Goddess Padmavati Devi. This was followed by Mahanaivedya Pooja along with Nityavidhi, Ratharohana and Maharathotsava. All throughout the proceedings devotees participated with devotion and religious fervour. People piled up in long ques to have a darshan of Goddess Padmavati Devi at Padmavati Temple. Their religious fervour reached its peak when the magnanamous attractive Maharatha was pulled by His Holiness Swamiji and thousands of devotees. Slogans such as “Bolo Parashwanth Bhagawan Ki Jai…”, “Padmavati Matha Ki Jai…”, “Mahamate Ki Jai…” were heard all through out the day. Hombuja, 26th March 2019: As a part of the annual rathayatra mahotsava of Lord Parshwanath and Goddess Padmavati Devi the Belli Rathotsava of Lord Parshwanath and Pushpa Rathotsava of Goddess Padmavati Devi were held at Sri Kshetra Humcha. It was held under the guidnace of His Holiness Swasti Sri Dr. Devendrakeerthi Bhattarakha Swamiji of Hombuja Jain Math. His Holiness Swasti Sri Bhanukeerthi Bhattarakha Swamiji of Kambadahalli Jain Math, & His Holiness Swasti Sri Dhavalakeerthi Bhattarakha Swamiji of Arihantagiri (Tirumalai) Jain Math were also present on the occasion. Hombuja, 26th March 2019: As a part of the annual rathayatra mahotsava of Lord Parshwanath and Goddess Padmavati Devi the religious gathering – Dharmika Sabhe was held at Sri Kshetra Humcha. It was held under the guidnace of His Holiness Swasti Sri Dr. Devendrakeerthi Bhattarakha Swamiji of Hombuja Jain Math. His Holiness Swasti Sri Bhanukeerthi Bhattarakha Swamiji of Kambadahalli Jain Math, & His Holiness Swasti Sri Dhavalakeerthi Bhattarakha Swamiji of Arihantagiri (Tirumalai) Jain Math were also present on the occasion. Siddanthakeerthi Award – Dr.S.D.Shetty a renowned researcher and Jain scholar was conferred with the Siddanthakeerthi award. Hombuja, 25th March 2019: Simhavahanotsava of Goddess Padmavati Devi was held at Sri Kshetra Humcha as a part of the annual rathayatra mahotsava. It was held under the guidnace of His Holiness Swasti Sri Dr. Devendrakeerthi Bhattarakha Swamiji of Hombuja Jain Math. His Holiness Swasti Sri Bhanukeerthi Bhattarakha Swamiji of Kambadahalli Jain Math, & His Holiness Swasti Sri Dhavalakeerthi Bhattarakha Swamiji of Arihantagiri (Tirumalai) Jain Math were also present on the occasion. Hombuja, 24th March 2019: Nagavahanotsava of Goddess Padmavati Devi was held at Sri Kshetra Humcha as a part of the annual rathayatra mahotsava. Goddess It was held under the guidnace of His Holiness Swasti Sri Dr. Devendrakeerthi Bhattarakha Swamiji of Hombuja Jain Math. His Holiness Swasti Sri Bhanukeerthi Bhattarakha Swamiji of Kambadahalli Jain Math, & His Holiness Swasti Sri Dhavalakeerthi Bhattarakha Swamiji of Arihantagiri (Tirumalai) Jain Math were also present on the occasion. Hombuja, 23rd March 2019: The 2nd national meeeting of Acharya Sri Shanthisagar Diksha Cenetenary celebrations were held at Humcha under the guidance of Acharya 108 Sri Vardhamansagarji Maharaj and Sangh. His Holiness Swasti Sri Dr. Devendrakeerthi Bhattarakha Swamiji of Hombuja Jain Math and other Bhattarakhas were also present. Office bearers from all over India had assembled at the meeting. The diksha centenary celebrations format to be held across India over the next one year was discussed in detail at the event. Acharya Sri Vardhamansagarji Maharaj released a book titled Charitra Chakravarthi in Hindi on the occasion. Hombuja (Shimoga District, Karnataka), February 15, 2019: Jain scholar Dr.Prof.S.D.Shetty has been chosen for the coveted “Siddhantha Keerthi Award”. He has been chosen award for his contribution to Jainism through research, archeology & literature. ‘Siddhantha Keerthi Award’ has been constituted by Hombuja Jain Math and will be given to Jain scholars every year for their contribution to Jainism. Prof. Shetty who hails from Uttara Kannada district of Karnataka currently resides at Ujire (Near Dharmasthala, Dakshina Kannada district). At present He is the director of Sri Manjunatheshwara Samskruthi Samshodhana Pratishtana and Manjusha Museum. He has worked in the fields of Kannada literature, Jainism and inscriptional Research. 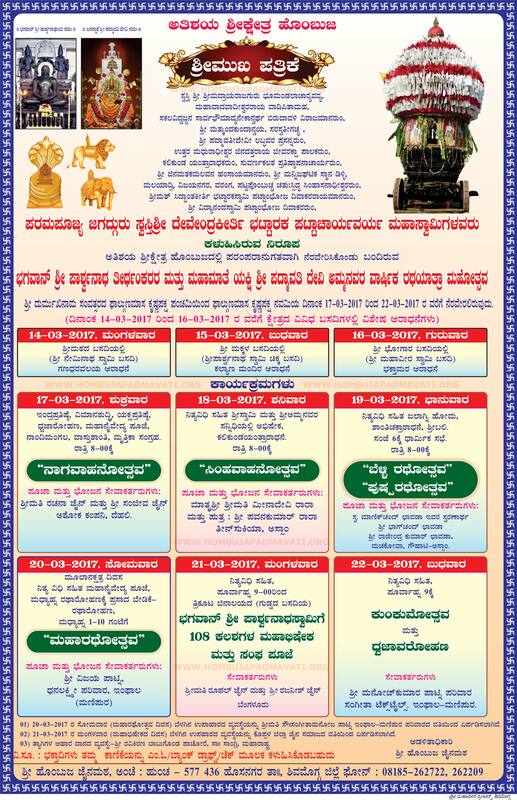 Varanga, Vijayammi Charite, Karnataka Basadigalu, Tulunadina Jainadharma – Ondu Adhyayana, Jainara Habbagalu are some of his books. He has authored many other books in Kannada on Jainism & Kannada literature. “Tulunadina Jainadharma – Ondu Adhyayana” is his research thesis that focuses on the research of Jainism in Tulunadu (Mangaluru and Udupi districts). The annual Rathayatra mahotsava of Lord Parshwanath and Goddess Padmavati Devi will be held at Sri Kshetra Hombuja from 24-29 March 2019. His Holiness Swasti Sri Deevendrakeerthi Bhattarakha Swamiji the pontiff of Hombuja Jain Math will present the award to Dr.S.D.Shetty in a religious gathering organised at Hombuja on 26th March 2019 as a part of the Rathayatra Mahotsava celebrations. The Award carry’s a cash prize of INR 35,000 and a plaque of honour. Photos of “Pushparathotsava” – of Lord Neminath & Sarvahna Yaksha at Sri Digambar Jain Math, Varanga, Karnataka – 22nd February 2019. 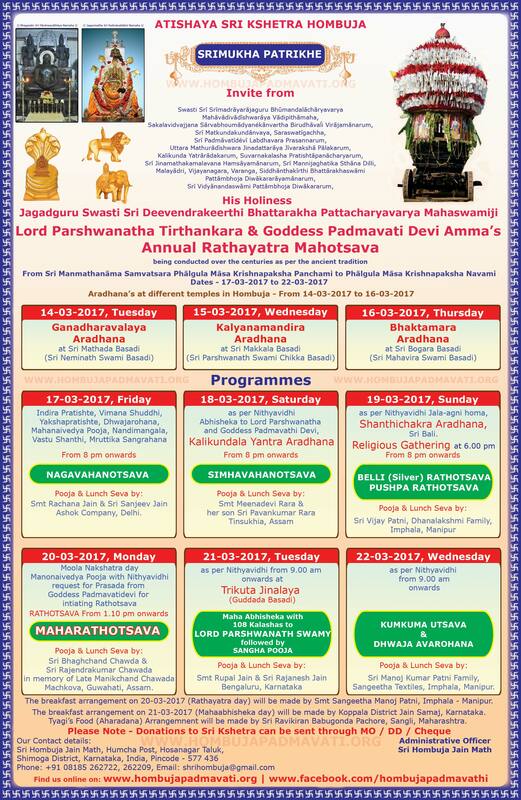 This is held as a part of the Annual Rathayatra Mahotsava under the guidance of His Holiness Swasti Sri Dr.Deevendrakeerthi Bhattarakh Swamiji of Hombuja Jain Math. 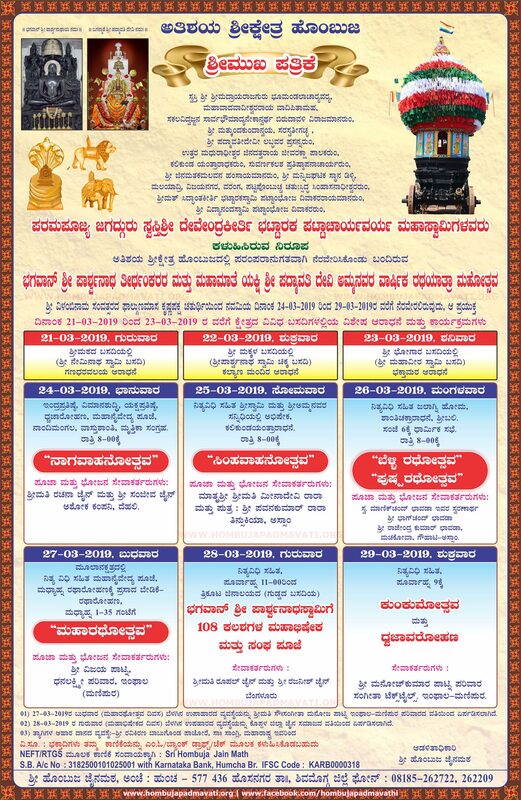 Hombuja (Shimoga District, Karnataka), February 15, 2019: The annual Rathayatra Mahotsava of Lord Parshwanatha and Goddess Padmavathi will be held with other programmes at Humcha from 24th to 29nd February 2019 under the guidance of His Holiness Paramapujya Jagadguru Swasti Sri Devendrakeerthi Bhattarakha Swamiji. 21st March 2019 – Ganadhara Valaya Aradhana at Sri Matada Basadi (Sri Neminath Swamy Basadi). 22nd March 2019 – Kalyana Mandira Aradhana at Sri Makkala Basadi (Sri Parshwanath Swamy Chikka Basadi). 23rd March 2019 – Bhaktamara Aradhana at Sri Bogara Basadi (Sri Mahavir Swamy Basadi). 24th March 2019 – Indira Pratishte, Vimana Shuddhi, Yakshapratishte, Dhwajarohana, Mahanaivedya Pooja, Nandimangala, Vastu Shanthi, Mruttika Sangrahana, Nagavahoanotsava (from 8.00 pm onwards) and other rituals. 25th March 2019 – Abhisheka to Lord Parshwanatha and Goddess Padmavathi, Kalikundala Yantra aradhana, Simhavahanotsava (8.00 pm onwards) and other rituals. 26th March 2019 – Nityavidhi with Jala-agni homa, Shanthichakra Aradhana, Sribali, Bellirathotsava, Pushparathotsava (from 8.00 pm onwards). 27th March 2019 – Moolanakshatra – Mahanaivedya Pooja along with Nityavidhi, Ratharohana, Maharathotsava (from 1.35 pm onwards). 28th March 2019 – 108 Kalasha Abhisheka to Lord Parshwanatha along with Nityavidhi at Trikuta Jinalaya (Guddada Basadi, from 9 am onwards). 29th March 2019 – Kunkuma Utsava & Dhwajarohana (flag hoisting). 26th March 2019 – 6 PM Onwards – Mangalacharana, Welcome address, Inauguration, Conferring of “Siddantha Keerthi Award”, His Holiness Swamiji’s address, vote of thanks. 27th March 2019 – 8 PM Onwards – Cultural Programme. 28th March 2019 – 8 PM Onwards – Cultural Programme. Humcha, 12th January 2019: The Mastakabhisheka of Lord Parshwanath at Guddada Basadi in Humcha was held in the presence of Acharya Sri Vardhamansagarji Maharaj and his Sangh and under the guidance of His Holiness SwastiSri Dr. Devendrakeerthi Bhattarakha Swamiji of Hombuja Jain Math. Humcha, 11th January 2019: Acharya Sri Vardhamansagarji Maharaj and his Sangh had a darshan of the Basadis of Hombuja on 11th January 2019. The sangh was accompanied by His Holiness SwastiSri Dr. Devendrakeerthi Bhattarakha Swamiji of Hombuja Jain Math. His Holiness Swamiji explained the history and antiquity of the temples to the Sangh.